As an esthetician, you’re a skin expert. You’ve seen it all and you probably know that most conditions are easily treatable and fixable. But when your clients come to you with any concerns about their skin, you need to be compassionate and understanding. It may seem an easy fix to you, but it’s their skin! Here are 3 ways to professionally address your client’s skincare worries. Make sure to be empathetic to your clients. Even though you have probably seen it all before, you can’t make light of their concerns. It can sometimes be hard to get clients to calm down if they have self-diagnosed their issue and just want a quick fix, but this is a vital step in the process. Before you touch their skin, have a conversation. What do they think is going on? What kind of skincare routine do they already have? Consider what they do well—and where you know they could do better. Take a close look under the bright lamp to determine your client’s skin type, conditions, and the best way to treat their skin during their facial. Before you even touch your client, you should easily be able to see conditions like oily, congested skin; breakouts; dry, dull, aging skin; sensitive, red skin, and fine lines and wrinkles. 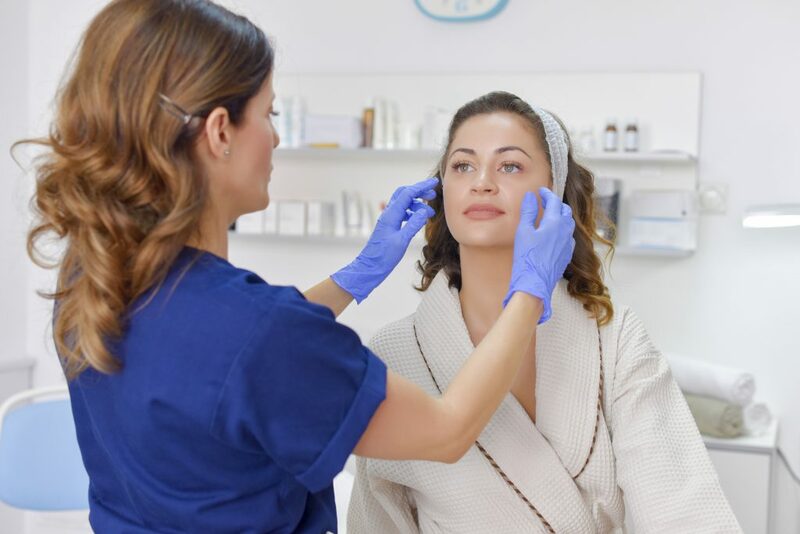 A good tip is to have your new clients fill out a form that will answer questions about their skin concerns, diet, and medications so that you can determine what factors may contribute to your client’s skin issues. During the skin analysis, you should tell your client what you see that is positive, as well as how things could be improved. You should also let your client know if there is anything that they should have a dermatologist look at. Identify whether your client has oily, dry, combination, or normal skin. Their skin type will likely have a lot to do with how much oil their skin produces. Remember that skin type can change over time or with seasons, so if you have long standing clients, be sure to check in with them about how they feel their skin is looking and feeling right now. Skin type is important for you to know because it will determine what kind of products and techniques you use during treatment—and what you advise them to use on their own. Once you determine skin type, then take a closer look at your client’s skin. Is it congested with blackheads or whiteheads? Do they have acne, wrinkles, or sun damage? Is their skin dehydrated? These are all questions you should ask yourself before you begin treatment. You should discuss what you see with your client and determine the best course of action for their facial, whether that’s extensive extractions or something more calming to increase hydration. Skin is more complicated than it looks. After all it is the largest organ of the human body! But you’re an expert. You know how to help your clients look and feel their beautiful best. If you’re not already a licensed esthetician, find out how you could start in this rewarding career. Contact Salon Success Academy today and schedule a school tour. We have six campuses throughout the Inland Empire are.